"Everybody can be great...becuase anybody can serve. You don't have to have a college degree to serve. You don't have to make your subject and verb agree to serve. You only need a heart full of grace. A soul generated by love." -Dr. Martin Luther King Jr.
Katrina is a tragedy we will never forget. But today....today we celebrate the human spirit. We have over 300 volunteers giving their time to New Orleans City Park today as part of the K10 City Wide Day of Service! They're from several sources, including Xavier University, Tulane University, Sacred Heart Academy, Mid City Rotary Club, along with many individuals who volunteered on their own. Today the volunteers worked to mulch the trails in Couturie Forest. After Hurricane Katrina, Couturie Forest became a laboratory for the rebirth of a forest. The more often you visit, the more you’ll see the gradual, natural revitalization taking place, including the restoration of a tree canopy, the eradication of invasive species, and the growth process of thousands of new saplings. Couturie Forest wouldn’t be possible without the support and work of volunteers. Volunteers also worked today to cut down the invasive specie Chinese tallow trees near Pan American Stadium. Trees play a vital role in City Park’s natural beauty. Since Hurricane Katrina, Park officials have planted more than 6,500 live oaks, cypress, magnolia, and pine trees. City Park is home to 16,000 trees – each tree removes 120 - 240 pounds of pollutants from the air each year. In an effort to preserve City Park’s diverse collection of trees, the Park incorporates tree trimming and root protection standards into all construction documents. In the coming years, Couturie Forest alone is expected to double in size from 30 to 60 acres. Check out our City Park Invasive Species Guide (here) for more information on the invasive types of trees we fight each day in City Park. We're so lucky to have volunteers and we thank you all from the bottom of our hearts! The work doesn't stop today; however, we continue to need volunteers throughout the year to keep City Park moving in a positive direction. Should you, your friends or family, or an organization want to volunteer in CIty Park, please get in touch with our Volunteer Manager, Earl Sires. Earl works hard each day to keep the Park looking its best by using both the time volunteers put into the Park but also the donations that often come with corporations volunteering. Please contact Earl at ESires@nocp.org. Check out this link to see information on the Katrina Then and Now boards placed at Big Lake now through September 2015. Say the name Beau Bassich or just think of him and I bet a smile comes to your face. It is all but impossible to think of Beau without feeling good and being happy. Beau always greeted me in the same manner: “Hey Hoppaah.” What was special was that he would then look me in the eye and convey that there was no one else in the world he would rather be talking to. It is a memory I will cherish and try to emulate. Beau loved all parts of the park, but none more than the Carousel. 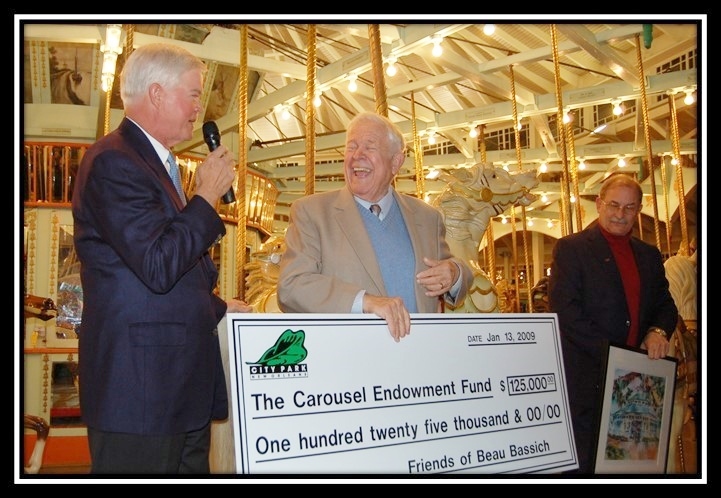 It is because of his friends and family that the park now has a Carousel Endowment. As you can see in the picture, it started at $125,000 and has grown to more than $300,000. Please write “Carousel Endowment” in the memo line. Or click here to give electronically. Today, New Orleans City Park cut the ribbon on a new playground at the already popular Festival Grounds. Located between Christian Brothers School and the Reunion Shelter on Friedrichs Avenue, the playground sits inside a paved concrete circle. It is that circular shape that lent its geometric details to the playgrounds name: Sir Cumference.